The British are Coming!! The British are Coming...Again!! On October 16, 1777, British troops invaded Kingston and torched over 300 homes, barns and other buildings. 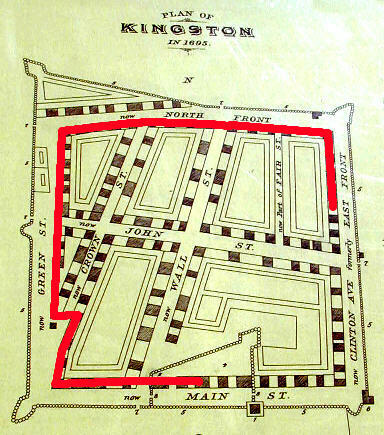 At the time, Kingston was the capital of New York, which was forced out of New York City when the British invaded there. The invasion forced the state government to move even further north and would eventually settle at Albany. British Major General John Vaughan, who led the invasion, justified the destruction of the city because it was "a nursery for almost every villain in the country." 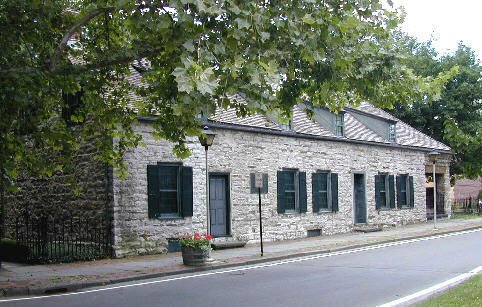 But many of the stone houses in Kingston’s stockade still stand. Today, these homes, despite the torching, are used as residences, offices and restaurants, a testament to their sturdiness over the centuries. As a memorial to those heroic citizens of Kingston because of whose patriotism the village was burned by the British forces under the command of Maj. Gen. John Vaughan on the 16th day of October 1777. This tablet is erected by one of the members of Wiltwyck Chapter Daughters of the American Revolution on the 16th day of October 1914. From the Visitor’s Center, begin a walk around the stockade on Clinton Avenue to the first of the surviving houses, the 1676 Senate House at 331 Clinton Ave. 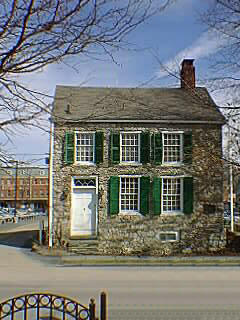 Built in 1676, it is the oldest public building in America. Descendants of the original builder, Wessel Ten Broeck, occupied the residence until they deeded it to New York State in 1888. Col. Wessel Ten Broeck born at Westphalia, 1635. Erected this stone house about 1676 wherein the first Senate of State of New York met after the adoption of the first constitution 1777, until the burning of Kingston, October 16, 1777. The first New York State Senate met here in September and October of 1777 when the building was the home of Abraham Van Gaasbeek. They met to form a new state government. They adopted a system, comprising a senate, assembly, governor, and judiciary that still exist today. Every one of the assembled delegates placed their lives and property at risk by being so openly disloyal to the Crown. The Senate House is open Wednesdays to Saturdays from 10 AM - 5 PM and Sundays from 1-5 PM from April-December. In March it is open only on weekends. Tours are offered periodically. Walk north to the intersection with North Front Street, turn left and walk to the intersection with Crown Street. In the southeast corner of the intersection is Peace Park. This is the site where the Jacobus S. Bruyn House once stood. Bruyn was a company commander during the Revolution who was captured in 1777 and held prisoner until the end of the war. Built by Nicholas Hoffman 1711 on part of Crown Grant of land made to his father Martinus in 1688. This is the northwest corner of the old stockade. Friends of the Senate House, 1965. 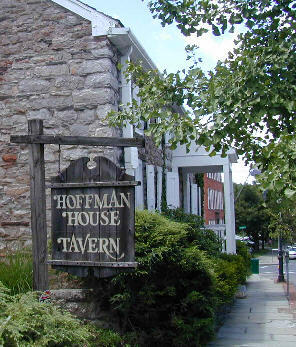 Walk west to the Hoffman House Tavern that is just before the intersection with Greene Street. The tavern is a great place for food and spirits and is a recommended spot to return to later for dinner. The house is situated in the northwest corner of the stockade. The original house built prior to 1658 was much smaller than the current building. Musket holes in the upper floor indicate that the original house was likely used as a corner defensive position for the stockade. Anthony Hoffman, a member of the Provincial Congress and a signer of the Article of Confederation, lived in the house during the mid-1770’s. Turn south on Green Street. Watch for the intersection with Lucas Street on the right. Just pass this intersection, also on the right is the Egbert Dumond House at 147 Green Street. The Dumond house, circa 1665, was likely given a Federal style makeover after the 1777 British torching. The architecture of the house is unique with so many split-levels that no two rooms are on the same level and the walls of the house are two feet thick. Continue walking south to the intersection with John Street. In the southeast corner of the intersection is the Gerret Van Keuren House. The home was built around 1725 and was torched in 1777. Restored in the 1920’s, its long, low structure is considered one of the best examples of Dutch style architecture in the stockade area. Across the street from the Van Keuren House is the Colonel Abraham Hasbrouck House. Colonel Hasbrouck served with the Northern Militia of Ulster County during the American Revolution and lived here from 1735 -1776. Continue walking south on Green Street until you come to the intersection with Crown Street on the left. The home that is wedged between Crown and Green Streets is the Henry Sleight House and was built in the late 1600’s. It is currently the headquarters of the Wiltwyck Chapter of the Daughters of the American Revolution. Just west of the Sleight House is the Judge Lucas Elmendorf III House. Judge Elmendorf was a three-term Congressman from 1797-1803 and a close associate of Thomas Jefferson. The home was built after the American Revolution around 1790. Just east of the Sleight House is the oldest surviving house in the stockade area, the Christopher Tappen House, was built around 1670. In 1777, Tappen was the Deputy County Clerk and is credited with saving the records of the county from the torch. The house later became the city’s first post office. Was deputy county clerk in 1777 and saved many records when British burned Kingston. Reputedly the oldest house in Kingston and the first post office. Friends of Historic Kingston 1976. Continue walking south on Green Street to the intersection with Main Street. Walk east on Main Street until you reach the intersection with Wall Street. In the northeast corner of the intersection is the John Sudam House. The house built in the early 1800’s includes Washington Irving and President Martin Van Buren as overnight guests. Today it is the Fred J. Johnston Museum and features 18th century furnishings and decorative arts. The museum is open from May to October. This church organized in 1659 and chartered November 17, 1719 under His Majesty George King of Great Britain was served until December 1808 by pastors educated in the universities of Holland and Germany who preached in Dutch — the first sermon by the first pastor was delivered September 12, 1660 by whom the Lord’s Supper was first administered. On the 26th of the following December, a minister’s house was built in 1661 which subsequently was used both for religious duties and civil affaires. In 1679, a stone church was erected on the south-west corner of this lot which edifice was notably improved in 1721 and was rebuilt and dedicated November 26, 1752, N.S. The latter which is here represented was burned by the British, October 16, 1777 was renewed, extended in 1790 and was finally demolished in 1836. The next church was built of brick, dedicated August 20, 1833 and was located on the southeast corner of Wall and Main Streets. The last and present edifice (lecture-room on the north enlarged 1882) was dedicated September 28, 1852 during the pastorate of John Cantine Farrell Hoes, D.D., 1845-1867 to whose memory and that of his wife Lucy Maria Randall of Cortand New York, this tablet, as a record of the church and their association with it, is lovingly inscribed and presented by their daughter, Mary S. Hoes Burhans, Easter day 1900. The Old Dutch Church across the street from museum is the final stop on this walk around the stockade. 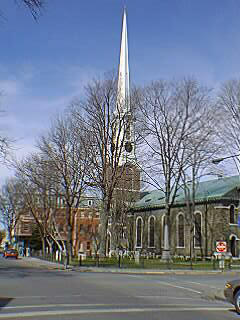 Although the church was built in the 1850’s, the congregation was organized in 1659. In 1777, the church was completely gutted by fire, but was repaired and used for another half century. The present church was constructed to house a growing congregation. Emphasizing the early struggles of the church, its motto is from Psalm 127:1 is: "Nis! Dominos Frustra” (Without the Lord all is in vain). In the churchyard are gravestones dating from 1710. Stones bearing a St. Andrew's Cross identify some of the persons originally buried on the site of the present church. 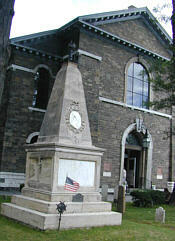 Among the notable persons interred in the present churchyard is George Clinton, brigadier general in the Revolutionary War, first governor of New York State, and vice-president under Thomas Jefferson and James Madison. George Washington visited the church in 1782. Born, July 26, 1739, Little Britain, N.Y. married February 7, 1770, Cornelia Tappen. Died April 20, 1812. Buried Washington, D. C. Ulster County Clerk, 1759-1812. Brigadier General, Revolutionary War. First Governor of New York State, 1777-1795, 1801-1804. Vice President of the United States under Jefferson and Madison, 1804-1812. Body and Monument brought to this site May 30, 1908. To the memory of George Clinton. He was born in the state of New York on the 26th July 1739, and died at the city of Washington on the 20th April 1812, in the 73rd year of his age. He was a soldier and statesman of the Revolution, eminent in council, distinguished in war. He filled with unexampled usefulness, purity and ability, among many other high offices, those of Governor of his native state, and Vice President of the United States. While he lived, his virtue, wisdom, and valor were the pride, the ornament and security of his country, and when he died, he left an illustrious example of a well-spent life, worthy of all imitation. This monument is affectionately dedicated by his children. One other point of interest that you might also want to find is inside the stockade at the intersection of Crown and John Streets. This is the only intersection in the United States where 18th century stone homes stand on all four corners. Built 1723, temporary capitol of state after burning of Kingston 1777. Hurley — When the British terrorized Kingston, you might wonder where everyone fled to. The town of Hurley is about three miles from the Stockade. To reach the town, head west on Clinton Avenue which eventually turns onto the road to Hurley. Hurley was settled in 1661. 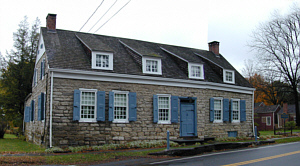 Like the Kingston Stockade, Hurley also has its share of eighteenth century stone houses. 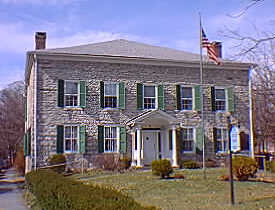 One house served as the senate building, thus making Hurley also a former capital of New York State. Overnight in Rhinebeck — A recommended spot for the evening is the Beekman Arms, which is across the Hudson River in Rhinebeck. Beekman Arms is the oldest, continually-operated inn in America and dates back to 1766. Although there is no record, George Washington purportedly reviewed the training of troops encamped in the area. To get to the inn from the stockade, return back to the intersection with Pearl Street and turn left. Pearl Street will become Albany Street that will become Route 32. Stay on Route 32 until the intersection with NY 199 (about 12 miles from the Stockade). Follow 199 across George Clinton Kingston-Rhinecliff Bridge and turn right onto River Road (County Route 103) and follow it to its end at Rhinecliff Road (about 4 miles). Turn left onto Rhinecliff Road and follow it to the intersection with US Route 9 (about 1 mile). Beekman Arms is on the right. Reservations are recommended (914-876-7077).